Hi friends. It’s summer and I’m hitting the skies again. Back to my favorite city to see some of my favorite people and enjoy the birthdays of my two favorite nations. The fleeting evenings this workweek will be spent on next week’s article (I know I already told some of you what it’s about) so today I just have a question for you. Whenever I ask the audience something, even if I’m just asking what’s happening, I’m moved by the response. Behind each of the names in the comment section is a vast, actively unfolding life and we all get to see so little of it, normally. The anecdotes are always so colorful and compelling, so much more interesting than fiction. I also love how the commenters start talking to each other and helping each other. I love that a large contingent of the (mostly) like-minded gather here regularly. What has been the hardest part for you? Of life, that is. I don’t mean the roughest period of time in your life, I mean the recurring theme that has always given you grief, particularly if you feel like most people don’t have a problem with it. Your answers and stories are always so helpful to me, and other readers too. I constantly find myself forgetting how complex everyone’s story is, and whenever I do my problems appear to me as the world’s great drama. And that’s not good for anyone. When other people open up, it gives us perspective about each of our own bags of hammers. Venting is totally welcome, but that’s not really what this is about. I specifically want to see people articulate what area (or specific issue) hangs them up the most. Throughout my life, I’ve let certain problems fester, for years even. Recently I’ve made huge progress on certain lifelong issues, and the amount of action it took to see a change was staggeringly small. All it really took to start changing things was to finally articulate the issue to someone else, in words. There’s something magical in that. I’m asking you to do that, here, even if you don’t normally comment. Tell us. What’s your problem? A professional thinker named Thomas Hobbes got it into our heads for an embarrassingly long time that our ancestors were pitiful, lonely, mean people. Today few serious scientists are waving the “brutish and short” flag. Although the image of the paranoid, dumb, violent, solitary caveman persists in pop culture (and sometimes in our early blog posts) there’s little evidence to support it. We now know human beings have always been highly social creatures, and that that has been our species’ defining strength. We know humans were nomadic for nearly all of their existence, roaming in groups of between 50 and 150 individuals. Rather than stressed, violent and solitary, they were probably most often calm, peaceful and intensely social. Moving away from Hobbes’ thuggish caveman is one of those fabled “paradigm shifts” that happen sometimes in science, and which turn everything upside-down for a few decades (or centuries if there are churches involved,) until we’re mostly on the same page again — think Copernicus and his wild “the earth isn’t the center of the universe” idea. You’ve probably seen the graphic above [if you can’t see it, it’s here], and it maybe looked like something brilliant and life-changing when you saw it. It is unlikely that it changed your life though. 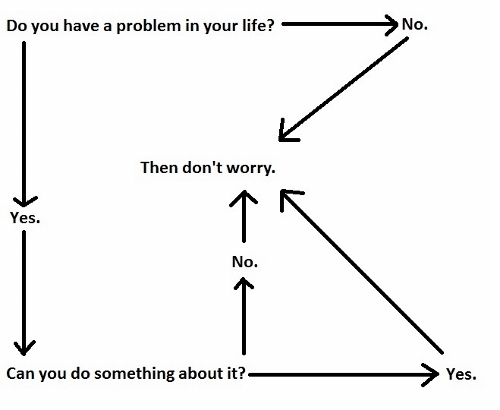 The stoics had this same roadmap figured out forever ago, and if it worked for them it’s because they knew what skills you needed to get to the big “Then don’t worry” at the center. And they practiced them. They didn’t think anything else in life was worthwhile. This graphic does make sense, but it leaves out the hard part. The arrows make it look like getting from worrying to not worrying is done in a few stretches of unfettered, instant travel, like snakes and ladders without the snakes. But some of the arrows represent high-level life skills that need to be identified and practiced if you’re going to consistently make it to the coveted “Don’t worry” at the middle under your own power. I want to break down what it really would take to get from one to the next, not that I’m calling myself an expert at any of them. Even if you don’t acknowledge this map as your own normal way of doing things, we are all somewhere on it at any time, trying to get to the middle. Some people have been stuck in one place for days, weeks, or years.